The team was called out to assist East Midlands Ambulance Service with the evacuation of a 78 year old female who had been walking in the Chee Dale area, a few miles east of Buxton. This is a beautiful spot for a walk at any time of the year, but especially when covered in the first snows of the year. The lady slipped whilst walking along the riverside path, resulting in a lower leg injury. 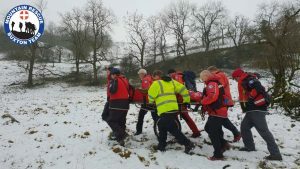 She was initially treated by a Tideswell Community First Responder who was sent to assess the situation. Thanks for your rapid response. 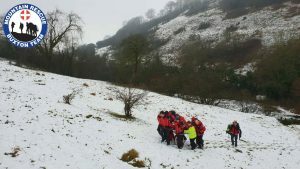 The lady was treated on the scene before being transported on a mountain rescue stretcher to the Monsal Trail where a land ambulance was waiting to take her to hospital. We all wish her a speedy recovery. This was our first snow related call of 2019, no doubt there will be more. Photo Credit: BMRT team member. Thank you for all your professional and very kind help following my son’s mother-in-law had to be rescued after a fall yesterday.